SSC CHSL 2018 Exam -The Staff Selection Commission (SSC) has released the notification of SSC Combined Higher Secondary Level (CHSL) Examination 2018 on March 05, 2019 at ssc.nic.in. The application window also has been opened. The candidates can fill the application form until April 05, 2019. The candidates who have completed their 12th and are in the age group of 18 to 27 years can apply. The vacancies are not notified yet, will be notified in due course. The SSC CHSL 2018 Tier I examination will be held from July 01 to 27, 2019. The Tier II examination will be conducted on September 29, 2019. Get, here all the details regarding SSC CHSL 2018 Exam. The vacancies under SSC CHSL are for the post of Lower Division Clerk (LDC)/ Junior Secretariat Assistant (JSA), Postal Assistant (PA)/ Sorting Assistant (SA), and Data Entry Operator(DEO). It should be noted that this year there is no vacancy for DEO Grade “A”. Candidates can check all the important dates for SSC CHSL 2018 from the table below and the details vacancies can be checked by reading further. The scanned copies of the Photograph and the Signature should be in JPG format. The size of the Photograph should be between 4KB to 20 KB and the same for Signature has to be between 1 KB to 12 KB. Next, the candidates will have to submit the details in the application form. All the details should be entered correctly. The candidates will also have to remit the application fee, which is Rs. 100. 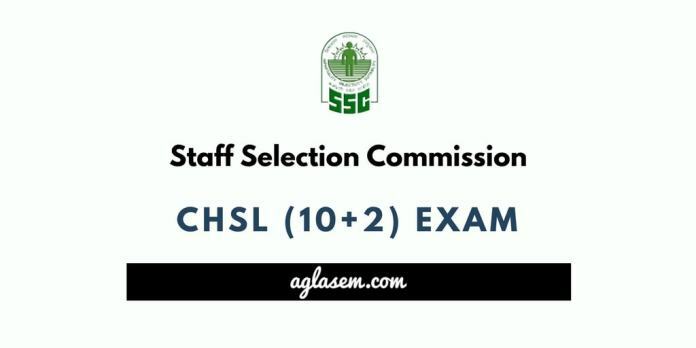 You are eligible to appear in SSC CHSL Exam 2018 only if you fulfill eligibility criteria. Expected eligibility criteria are as follows. or subject of Nepal / Bhutan or a Tibetan refugee who came over to India, before the January 01,1962, with the intention of permanently settling in India or a person of Indian origin who has migrated from Pakistan, Burma, Sri Lanka, East African countries of Kenya, Uganda, the United Republic of Tanzania(Formerly Tanganyika and Zanzibar),Zambia, Malawi, Zaire, Ethiopia and Vietnam with the intention of permanently settling in India. Candidate should be between 18 to 27 years old as on 01 January of the year. Check age relaxation here. All the degree/ diplomas/ certificates including technical education degree/diploma awarded through Open and Distance learning mode of education by the Universities established by an act of the government of India. Staff Selection Commission Admit Card will be released online. For the sake of the candidates’ direct link to will also provided in Admit Card page. Staff Selection Commission regional / sub-regional websites host admit cards. Admit card of SSC CHSL 2018 will be available separately for Tier 1, 2, 3. Candidates can download admit card / hall ticket / admission certificate from website of regional / sub-regional SSC. Candidates have to enter registration number and other login credentials to download admit card.The only mode of obtaining admit card is online. Admit Card shall contain time table and venue of examination apart from candidate details. It is compulsory to take admit card along with photo ID (voter ID/driving license / ID card issued by a government or other offices where the candidate is working), 3 passport size photographs. Also referred to as scheme of examination, exam pattern refers to subjects in SSC 10+2 Exam 2018, marking scheme, mode of exam. Given below is expected exam pattern. As soon as notification releases, the actual pattern for CHSL 2018 will be updated. Knowing syllabus of SSC CHSL 2018 is a key part of doing well in the exam. SSC 10+2 2018 Exam Syllabus contains topics on which questions are asked in the exam. You can get details syllabus from the Syllabus page.